WALTER RODNEY. 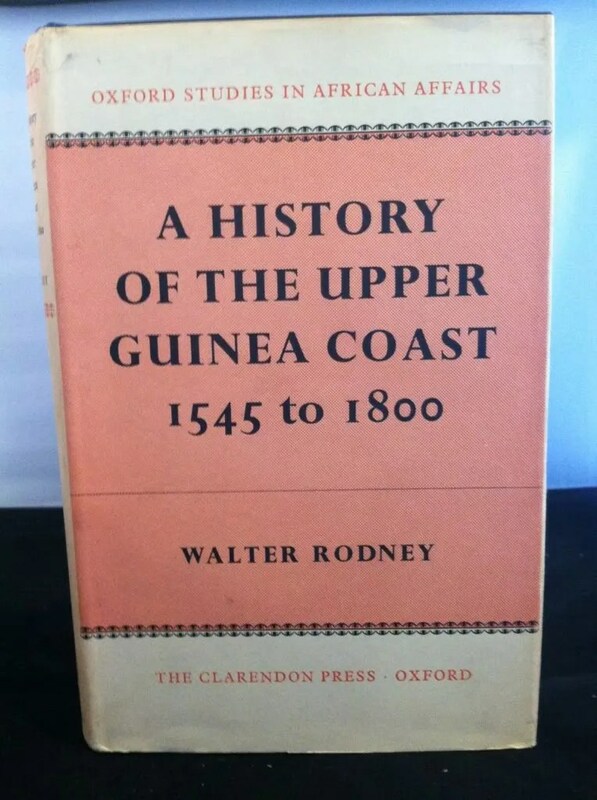 History of the Upper Guinea Coast, 1545-1800 (Oxford Studies in African Affairs). New York: Oxford University Press, 1970. Pp. ix, 283. $7.00. History of the Upper Guinea Coast is the refurbished dissertation of the late Guyanese historian and political activist, Walter Rodney. Originally written in 1966 for a PhD in African History at the School of Oriental and African Studies in London, the text is a chronological/conceptual history of a section of the West African coast (between the Gambia and Cape Mount) from its first contact with Hispano-Portuguese sailors in the mid-fifteenth century until approximately 1800. The book was a response to contemporary scholarship—which Rodney criticized as too scarce and projecting colonial boundaries onto the precolonial past—and a formative work in the “New Orthodoxy” of African History, dedicated to writing the history of Africa for its own merit, “not as an appendage to anything else.” As a work that traces a complex web of coastal African societies from pre-European contact through the early-modern era, History has no rival; it dispels popular misconceptions while offering a nuanced critique of both developing Afro-European commerce and inherent African social hierarchies. Rodney focuses on a cultural and geographical region known as the “Rivers of Guinea.” This area is much like the Upper Guinea Coast described by John Thornton, except that it excludes the northern region of Senegambia. For sources, Rodney consults archival material in England, Portugal, Spain, and Italy. Although the Dutch and French were significant presences on the coast, Rodney presents them as secondary to Hispano-Portuguese and English activities. These activities are mainly derived from two archives—the Arquivo Histórico Ultramarino in Lisbon and the Public Record Office in London. Rodney combines these with charts [roteiros],registers [registros], and writings from a diverse cast of contemporary Europeans: admirals, explorers, traders, printers, physicians, and missionaries. Among these, Álvares de Almada, Lemos Coelho, Jean-Baptiste Labat, and Nicholas Owen are a few of the most cited. Rodney begins the book by describing the social, political, and environmental conditions of the “Rivers of Guinea” before European contact. Here he uses linguistic techniques to illustrate the central importance of both wet and dry rice harvesting on the riverine coast. Then he critiques H. Baumann, who saw the region as separated between coastal groups of the West Atlantic and interior groups of the Upper Niger. Rodney rejects the prevailing notion that coastal peoples were primitive because they “did not erect a superstructure of states.” He then positions the interior mountains of the Futa Djalon as a “crucial transitional zone between Western Sudan and the Upper Guinea coast.” The westward migration and conquests by centralized states, mainly of Mandé and Fula extraction, combined with European encroachment to overwhelm littoral societies by 1800. This two-way pressure forms the central conflict of the narrative. Contrary to John Thornton, Rodney argues that West African societies did practice land ownership, and they were organized around social hierarchies rather than institutions of slavery. Although Mungo Park referenced widespread slavery in the 1790s, early Hispano-Portuguese writers spoke only of “incipient class distinctions” between African fidalgos [nobles] and plebeus [commoners]. For this reason, Rodney places the African portion of responsibility for the slave trade squarely on “tribal rulers and elites.” To do this, he argues that European chroniclers of the seventeenth and eighteenth centuries were not observing traditional societies. Rather, they were observing coastal groups that had been altered by centuries of profound change, namely the syncretic process of “Mandiguization” and prolonged exposure to European commerce. On this point, Rodney reminds us that Hispano-Portuguese traders had been exporting slaves to plantations on the Cape Verde Islands as many as 330 years before Mungo Park visited the Gambia. This early period of the slave trade provided ample time for West African societies (coastal and interior) to learn European notions of slavery. Lastly, Rodney uses the longue duree to reject the prevailing notion that firearms, famines, and alcohol played significant roles in the first centuries the trade. Although Rodney agrees with John Thornton that Africans were treated equally as “personal contacts,” and Europeans had to recognize “the sovereignty of local rulers,” he argues that there could be “no equality in the commercial nexus.” Europeans and Africans approached commerce with fundamentally different motives: the former for profit (merchant economy) and the latter for hospitality (gainless barter). As such, the Atlantic trade was “entirely detrimental” to African societies because they were as a weaker stage of development. Although Europeans could not secure monopolies or political control—and they had to provide gifts [boonyar] and taxes while putting up with frustrating customs like palavers—they were ultimately the ones that accumulated capital. By the eighteenth century, West African societies had become completely reorganized to serve a foreign capitalist system. African measurements, like the “country bars,” became instruments of European market economies; customs, like the sauce palaver, were restructured to support slavery; secret societies, like the Poro, became dominated by chiefs that supported the slave trade; and centralized states like the Susus, Fulas, and Mandingas were cultivating “slave towns” and leveraging Islam as a justification for enslaving infidels. In all of these critiques of Afro-European commerce, readers will notice precursors to Rodney’s controversial and more-famous monograph, How Europe Underdeveloped Africa (1972). Rodney’s diverse critiques of Afro-European commerce are encapsulated by his passing comparison between West African societies and the Spanish Empire during the early-modern era. Because Spain could not develop the complex financial infrastructure needed to secure its exorbitant wealth from New World colonies, those monies eventually flowed into the coffers of northern European states that were able to mobilize banking, insurance, and mercantilist industries. However, while appreciating Rodney’s nuanced condemnations of Afro-European commerce, it is also important to remember that European activities form only one half of the historical problem for coastal societies like the Sape, Bullom, or Beafadas. The other half of this problem is formed by the westward expansion of centralized, African states. History of the Upper Guinea Coast is much more than just a systematic critique of Atlantic commerce. In an important chapter on “legitimate trade,” Rodney expands our notions of Afro-European relations beyond slavery, demonstrating the forgotten “potential for constructive innovation.” Reminding readers that English companies were trading in camwood, and not slaves, as late as the 1620s, is just one way that Rodney uses the longue duree approach to widen our historical perspective. Throughout the text, readers benefit most from Rodney’s expertise in both Hispano-Portuguese and English activities, as the experiences of these two cultural groups served as bookends to the institution of Atlantic slavery on the Upper Guinea Coast. Finally, in sections about interstitial Europeans [lançados], “castle slaves” [grumetes], and Afro-Portuguese traders [filhos da terra], Rodney shows the crucial role that intermediaries played as the “middlemen of commerce.” He positions these individuals as a “cultural phenomenon” and “the most salient representations of a powerful social formation.” Living with a precolonial, DuBoisian double-consciousness, these individuals challenge our polarized notions about Afro-European relations in unique ways: they were multiethnic, they spoke creole languages, they wore Catholic rosaries, crucifixes, and West-African gree-grees, and they negotiated tense relationships with both European traders and African chiefs. Like the African groups of the Upper Guinea Coast, they remained suspended between two equally demanding worlds, hoping to survive and profit from the “violent contradictions” that defined them.